Jerez-El Maestro Sierra was founded in 1832 by José Antonio Sierra, who had been a master carpenter. 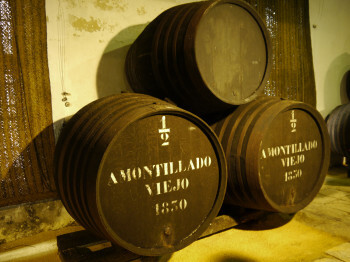 As such he was responsible for building barrels for all the major Sherry houses. Eventually he set about building a small winery with the aim of making the best Sherries possible. After many hardships he was able to establish and grow his business, becoming one of the top almacenistas (stockholders) of high quality Sherries. Poking fun at his struggle, the label depicts a fox hunt of that time period with the “nobles” hunting the fox (El Maestro Sierra).El Maestro Sierra is currently run by three generations of women, an absolute rarity in the Sherry business. Pilar Pla Pechovierto currently owns El Maestro Sierra, she is assisted by Ana Cabestrero and Juan Clavijo who are the capataz, or cellar masters. Doña Pilar is a widow whose husband was a direct descendent of the family. She has respected her husband’s wish that the winery remains in operation and over the last thirty years has been selling very limited stocks. Because the wines have remained virtually unmoved due to the very low business, the stocks at El Maestro Sierra are some of the oldest in Jerez. Unfined, unfiltered and absolutely traditional, El Maestro Sierra is the jewel of Jerez.